Even though I already have done an income report for both of my niche sites already I thought it would be a good idea to give a little more detail about each one of these sites. I want to discuss all of the details that I can but I am not going to give out the actual URL of the site or the niche because I have seen too many public niche sites get ruined from someone else. So I am going to keep those two things private but I am going to try and keep everything else as transparent as possible. Let’s get into it! I want a way to be able to identify each site besides calling them 1 and 2 so I will be using the first letters in each word in the URL. So the first niche site will called TZC and from now on it will be referred to as that. I hope this isn’t too confusing for you all. The niche for this site is in the outdoors niche. Like I said earlier I don’t want to get specific as for the niche but it is in the outdoors/hunting niche. A lot of the products that I am selling are priced under $100 but I was fine with this because there is a lot of potential traffic that I could get from this niche. There are multiple keywords that have over 10,000 monthly searches and I am ranking pretty highly for these keywords as well. I can get away with promoting lower ticket items because I am able to sell a lot more of these items. I also liked this niche because there wasn’t an authority site already in this niche and my site could slowly become that authority. This site is monetized through Amazon’s affiliate program and I have really liked their program so far. I am not going to deep into the earnings because you can check out the income report for that here. I will just briefly show the earning from this site so far. The site started around the beginning of April. The site has a lot more potential to earn even more and so far it has shown good growth. There have been some rankings drops early in June and they are slowly starting to come back but that has affected the earnings so far this month. I would not be surprised if the earning from June don’t reach May’s earnings. You can see from the screenshot of my google analytics above that the traffic dropped a little at the beginning of June but it looks like it is slowly coming back and hopefully it can get back to where it was around mid May. I was getting around 250 visitors a day during then but since it has dropped to around 150 a day now. I am working on getting the rankings back and I think it will take just a couple more links. Right now the site has a total of five pieces of content. I am only trying to rank three of these pages and those three pages are where I am making all of my sales. I am thinking of getting articles written for each individual product that I am promoting and I will probably get those written some time this month. I have found a very good writer on Elance for this site. The author is an expert in this specific niche and actually is a writer for a magazine in this niche. He charges around $50 an article but his work is fantastic. I gladly pay that much for his articles. As you can see from the rapid growth of traffic coming to the site the link building techniques I am currently using is working very well right now. I am using my own private blog network and currently it is around 25 sites. I would say that there is maybe a total of 20 links coming from these PBN sites to this site. That is all I really needed to get some great rankings and to start earning some money. I will probably buy some more PBN sites and use those to help rank better but for right now the sites I have in my PBN are enough. Don’t worry if you have no clue what a private blog network or if you are intimidated by them because I was in your same position a couple months ago. It took some money and a lot of time learning to get it right but let me tell you it is not as hard as you think to have your own PBN. The future for this site is looking really good. If I can make this site into an authority in this niche then the earning potential is very high. I might try and find another way to monetize this site to go along with Amazon to try an diversity the income. Right now I am working on gaining my rankings back and I will be adding more content in the near future. I will be referring to the second niche site as WP from now on. I really hope this isn’t too confusing but I don’t have another way to identify the two niche sites. If it is too confusing please let me know in the comments below, thanks! This site is in the home improvement niche. I am planning on making this site a true authority in its niche because the site is actually made up of about 5 different sub-niches making one big niche. I can really expand in this niche and that is one of the reasons why I decided to pursue this niche. It might take longer to rank for but in the long run this site could be making a couple thousand a month. It will be a good while until we see those numbers but I see the potential in this niche. This niche has a lot of high ticket items in the $300-$400 range so I am not selling as many items as the TZC site but I am still making some good money with this so far. Right now this site is being monetized with Amazon and I don’t really see a reason to switch it up. So far Amazon has been great and the conversion rates have been good as well. I started this site in the beginning of April but there was no earnings to report for April, so I will just show the earnings from May. Just to show the growth of this site, so far half way through June the earnings are already $185. So only half way into June and this site has already earned more than all of the month of May. The chart above shows you that the traffic has steadily increased since the start of this site. Since the first of June traffic has really started to increase and on average there is about 125 visitors a day in June. In May there were only about 80 visitors a day. 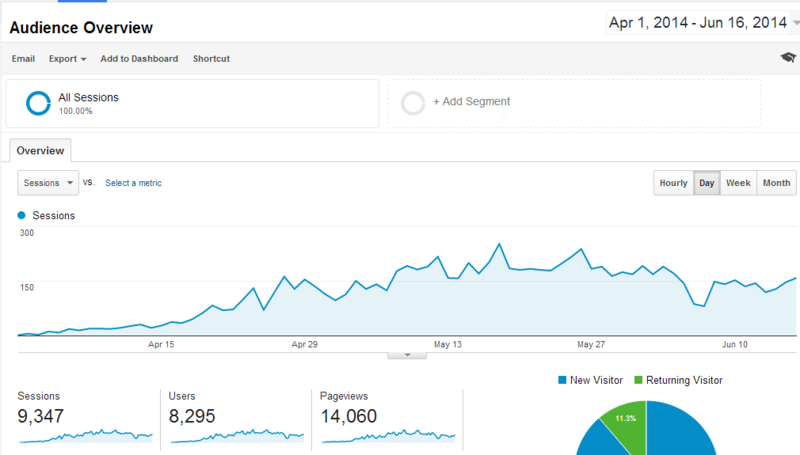 Traffic is increasing everyday and the more articles I add I only see the traffic going up. The earnings have correlated with the increased traffic as well. The site currently has six articles on the site and all of them are over 2000 words. These are like buyers guide for this specific type of product. I just put in an order at Elance for seven more articles to be written and I will continue to add content to the site if it proves to make me more money. At some point down the road I would not be surprised to see at least 100 articles on this site. Possibly even around 200. There is a lot of room to grow this site and this site has a ton of potential. The link building for this site is very similar to the link building for the TZC site. All of the links came from my own PBN and currently about 20 links are coming from this PBN. As I expand this site I will buy more sites for my PBN so I can link out to the new article posted on the site. The future for this site is very bright and I will continue to add content to this site as long as it keeps earning money. Like I said earlier I see this site earning a couple thousand a month when it peaks. I will keep you all updated as this site progresses. That does it for this post, I hope that you enjoyed this overview of my two niche sites that I am currently working on. I hope I gave enough information that you all get a good understanding of these sites, if you would like to know anything else that id didn’t mention then leave a comment below. I would love to hear your suggestions! Thanks for reading. 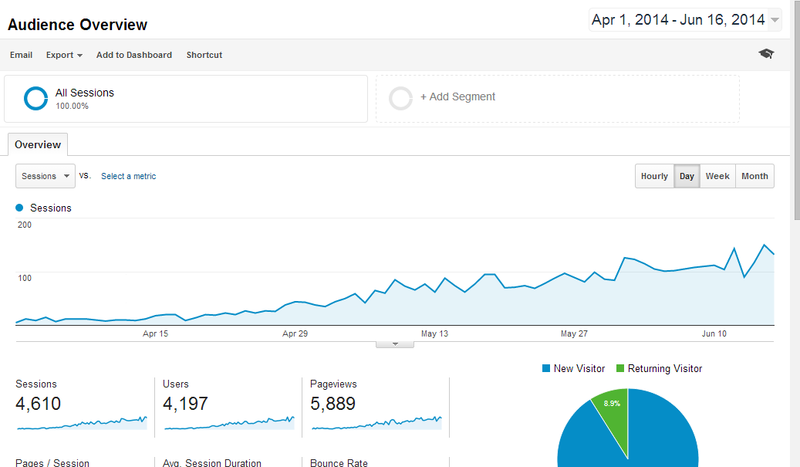 How did your websites’ traffic change after google changed their algorithms for mobile? Also, how is your link building strategy going? All of my niche site traffic actually increased after this new mobile update. I made sure that they were all mobile friendly about a month ago and it seems like Google liked that. And my link building was pretty stagnant the past couple of months but I am starting to pick things back up. I am really trying to improve the rankings and organic traffic in the next couple of months. Are you building links to homepage only or also to pages ? do you have any web 2.0 links ? how many pbn links to homepage ? and how about the anchor text ? No problem about the questions! 4. I keep the anchor text simple, never repeat the same anchor text for my links. I hope this answered your questions and if you have any more just ask, thanks for commenting!